What did you hear in this story? what struck you, or captured your imagination? What questions are raised as you read? Samuel, you may recall, is Hannah’s son. Hannah was barren, while her rival wife Penninah had many children and mocked her for barrenness. Hannah prayed and prayed, bargained with God, and ultimately gave birth to a son–whom she then returned to the temple, as per her prayer. (You can read more about this saga in 1 Samuel chapters 1 and 2.) Now Samuel is beginning to grow up, but he is still young. The priest, Eli, hasn’t exactly been the most responsible priest ever, and his sons are even worse. Have you ever heard something and been unsure if it was God or not? How do you discern between the call of others, the call of your own desires, and the call of God? What people do you have around you with whom you can check out your sense of God’s call? Do you identify more with Eli or with Samuel? Have you ever tried to pray simply by saying “speak, Lord, for your servant is listening” and then wait to see what happens? Someone has said that a large percentage of any task or relationship is just showing up. That’s true of our relationship with God, too. “here I am” is a great way to begin–just be there. How can you just be there–whether in your prayer life, in worship, or in opportunities to learn with others? Hmm—I got a little behind in the midst of my wisdom-teeth experience. Sorry about that. I kept reading but not blogging since I was having trouble making complete sentences or sitting up straight and using both hands (crucial for typing and also for icing ones cheeks…). But I think I’m back, basically well! We’ve covered pretty much the entire David and Solomon story line in just a few days—from the excitement of battles to the doldrums of idol worship, from the high places (bad) to the Temple (good), from the best in both (pardoning those who cursed them, asking for wisdom rather than power) to the worst (using their power for their own gain rather than for the glory of God and the good of the people). We’ve also covered several of the kings who came after Solomon, both in the northern kingdom of Israel and the southern kingdom of Judah (did you catch how there was only a united kingdom for two kings? Not at all a long time.). How glad are you right now that we don’t have the books of the Annals of the Kings of Israel/Judah? If we did, there might be a lot more stuff to read—instead we just get the highlights (or the lowlights, as the case seems to be.). Remember, most of this is Deuteronomic history, which means it’s based on a conditional understanding of covenant. “If you walk in my ways, then I will bless you.” With one small exception–in spite of all the disobedience, God keeps faith with David even through many generations. It doesn’t always look like it, and God certainly does get impatient more than once, but over and over the writers want us to remember David and his faithfulness, and God’s faithfulness to him. It will still be important to the gospel writers hundreds of years from now, just as it is important to these people writing for the Jews in exile. Anyway, since you’ve already talked about this stuff, and read it several days ago, I am going to leave you with some pictures and a few random thoughts. I hope that’s okay…I’ll pick up the day-by-day blogging beginning with the Elijah stories that start on day 26. Interestingly, the first thing the “bad” kings seem to do is institute worship in these places rather than in the temple (see below). One suspects they are doing two things simultaneously: 1) hedging their bets RE which deity is really in control of their prosperity and peace; 2) making a political statement. The Temple, built by the line of David, isn’t really they only place for worship, it’s not really the place where God lives, and there’s no need to be traveling into that other kingdom to offer sacrifices–look, we have an altar right here! You see, traveling to Judah to sacrifice in Jerusalem would mean spending money there, it would mean supporting the Temple and its priests monetarily, and therefore supporting that king monetarily as well. No good. Hence the new places for sacrifice in the northern kingdom–at Dan and Bethel and maybe at Shechem too (which have all been places of sacrifice before God got a big house). 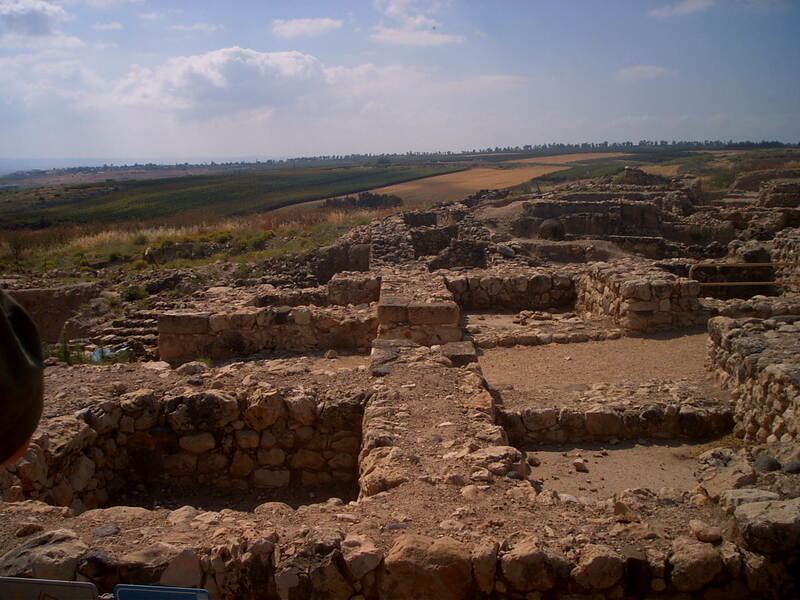 here we have two of Solomon’s building projects–to the left, the gates at the city Hazor. It’s a pretty big city, but all in ruins now. To the right is a view of the foundation/retaining wall on which the Temple was built. Straight ahead in the picture is the water tunnel that was talked about earlier in David’s story, and on the right is the wall itself (often called the Wailing Wall by Jews, who come here to pray). As you can see, the stones making up the wall are huge, as tall as most people. This is the only part of the Temple which remains–the retaining wall that made the hill of Mount Moriah flat enough to build on. last but not least, this is supposedly David’s tomb. Whether he’s in there or not, who knows. But this is where Jews to this day come to pray at the shrine of their greatest king. photo of David’s tomb and of wailing wall taken by jason of jasonclay.com. Other photos all taken by TCP. Today we have more stories about David and his leadership of the Israelites and how much they loved him. He is victorious in many battles, he is kind to the people who work for him, he gives generously to his friends. He grieves Saul and Jonathan, likely both because he is truly grieved and because it helps his public image. He finally conquers Jerusalem (it had been given to the tribe of Benjamin but the Israelites had not been able to drive out the Jebusites who lived there), and he makes it his capital. This is a wise political choice for David—it’s not been in actual possession of any of the tribes, it’s perfectly located on neutral territory between the northern and southern tribal groups/kingdoms (which are called Israel and Judah). Also the city has its own water supply—crucial for a capital! But that’s a lot of change for the Israelites—they’ve gone from judges to kings, from one royal family to another, from loosely affiliated tribes to a basically coherent kingdom, they’ve been in battle, they’ve changed “capitals” (or bases of operation, anyway). So David decides to bring the ark of the covenant into his new capital city—a sign of following the old traditions and also of the power of God that is with David, giving him victory and popularity. This story of bringing the ark to Jerusalem is one of my favorite stories. Poor Uzzah thinks the ark might be in danger of falling off the cart, and he reaches out his (ritually impure/not sanctified/not Levite!) hand to steady it and ends up dead. The power of God is still with the ark, that’s for sure! David sends the ark somewhere else, out of fear (remember, Proverbs says “the fear of the Lord is the beginning of wisdom”—maybe it is for David!). But the blessing that comes to that host family persuades David to try again and to do it right this time. Everyone is ritually sanctified, sacrifices are offered every 6 steps, and there’s dancing and singing like welcoming heroes home after a battle. What a great sight—to see the king leaping with joy in front of the ark! Too bad his wife didn’t like it. She, a daughter of Saul (and David’s main connection to Saul’s power-hungry ways), thinks David has shamed himself. But David knows that giving glory to God, even at the expense of looking silly in front of others, is never shameful. David does manage to shame himself, his descendants, his entire people, not to mention God, a few chapters later in the matter of Bathsheba and Uriah. We all know this story, so I’ll just say this: I love love love the courage of Nathan, who tells a parable (remind you of anyone?) and then is able to point a finger at the most powerful and beloved man in the land and say “YOU are the man!!!!! !” Speaking truth to power that way must have been difficult and frightening, but Nathan acts as a true prophet—he speaks God’s word, he tries to convey God’s vision, even if it could be dangerous to himself. What a guy! Today we see a progression in Saul’s instability—we watch his breakdown (and, as a mirror for the Israelites, theirs too) from the eyes of David. And we see a progression in David, from harp playing-shepherd boy to anointed warrior. Through it all, he is a “man after God’s own heart”—he doesn’t do violence against God’s anointed king, even though Saul deserves it in the eyes of some and even though Saul puts himself in positions where David could easily kill him. David plays the harp to relieve Saul’s mental anguish episodes (the first documented instance of music therapy?). 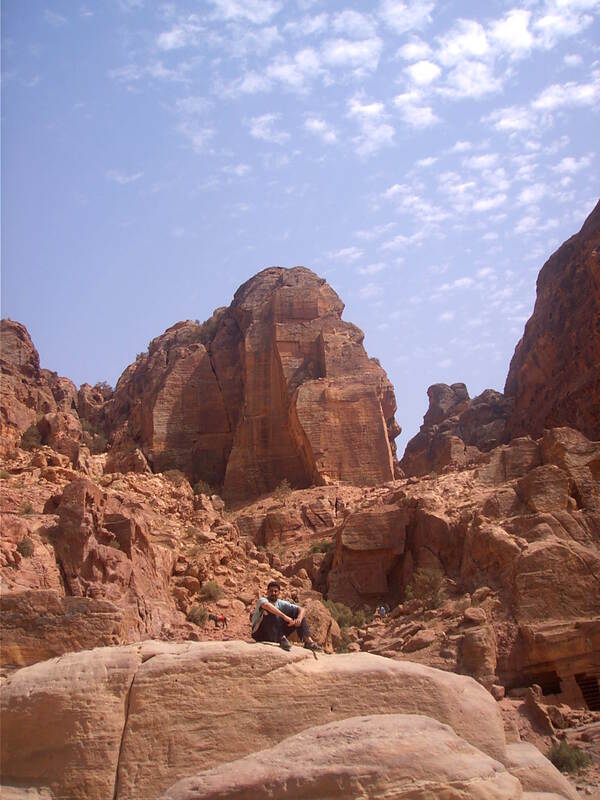 The books of Samuel (originally one book, most likely) were written after David, probably during the period of the exile. As we’ve noted before, the theological foundation is found in Deuteronomy, but the political motivation becomes pretty clear as we read these early stories of David—David is THE pre-eminent king of Israel, he’s the one, the anointed, the one who God chose and established, the one who united the tribes and created peace and defeated enemies and didn’t allow any straying from the LORD….you get the idea. In some ways the books of Samuel (and some other books in the Bible too) are hagiography—they are here to show us all the great things David did, how wonderful he was, as though he’s a saint. He’s here to be emulated, to tell stories about, to show us what a close relationship with the LORD looks like in everyday life. He is the anointed, the mashiach (which means anointed—and translates as “messiah”). This is what a great king he was, the best! and this is what our community looked like then—so let’s try to be that again. With that in mind, notice all the great things David does! He kills the Philistine (who may or may not be Goliath—we’ll find later that Elhanan killed a giant Philistine named Goliath too), liberating the Israelites from their fear. He doesn’t kill Saul when he has the opportunity—he uses non-violent means of getting his message across. His closest friend is the son of his rival. He is an accomplished shepherd, rock-slinger, harpist, singer, poet, warrior, politician, and friend. Most importantly, he follows God’s commands, he goes where God leads, he celebrates the LORD and he lives in awe of God. He is the definition of faithful. Meanwhile, Saul makes blunder after blunder, is tormented and anguished, and seems to think that power is his own rather than coming from God. He clutches at his power, killing indiscriminately, chasing his friend, bringing up the spirit of Samuel for guidance (since he feels God has deserted him), and getting into trouble. This is what kings do, right? David’s behavior suggests otherwise. Remember I told you we would get into the statues? Well, here they are! This bizarre episode takes place entirely between two gods: the ark of the covenant (the seat of the LORD) is placed in a Philistine temple to Dagon. 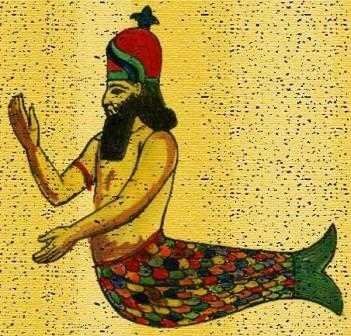 In the morning, the statue of Dagon is prostrate on the floor before the ark! The people put it back, but the next morning it is prostrate again, but this time with head and hands in the doorway! Whose god is more powerful? And yet the people want a king. Previously, the LORD has been the king—the LORD leads the people in battle, the LORD provides good land and instructions for building and everything the people need. But they want to be “like other nations”—not the different, holy, set apart, covenant community—they want a king. We’ve already seen that hereditary succession goes badly—the sons of Eli, the priest/judge, were horrible and corrupt. Even Samuel’s sons, installed after him, are corrupt—they took bribes and perverted justice. Both of these are early warnings that the person called and equipped to lead the people is not necessarily the son of the last leader—God calls and anoints and equips. Saul is the first king to be anointed, and for a while he does a good job. But soon enough he turns aside from the ways of God for personal gain, proceeding unlawfully with a sacrifice so he can get on with battle already before his army all deserts. He obviously doesn’t remember the stories of God leading the people in battle with only 300 warriors. Samuel knows, before he even arrives, that Saul has done something wrong. From this point on, Saul is on the downhill slope of his reign. Samuel says “the LORD would have established your kingdom forever…” but not anymore! After this point, Saul begins to make more and more rash decisions and oaths, nearly gets his son Jonathan killed (and this is just the first time), and then it all culminates with Saul violating the rules of ritual warfare. The way it works is like this: God “gives the city into your hand” (the hand of the Israelite army), then the army kills everything as a ritual sacrifice (and often burns it right there), keeping no booty, nothing to enrich themselves at the expense of the others. But Saul takes the animals out to sacrifice somewhere else rather than in their city, and thus breaks the rules. Then Saul discovers that he is for sure rejected—God is “sorry” that Saul was anointed king and determines to anoint someone else “after his own heart” (the first time David is described this way, but not the last!). You see, the issue here isn’t the sacrifice itself or where/when it’s offered—it’s obedience. Deuteronomy 6 (the main theological foundation for all these writings up through the book of Kings and also many of the prophets) says “HEAR, O Israel” which also means “OBEY, O Israel”—serve/love the Lord alone, and no one else. Saul has declined to obey and so has put himself above God, and therefore is unworthy to be king. Which leads us to…tomorrow! PS—an interesting note: isn’t it funny how Samuel says to Saul “The Glory of Israel will not recant or change his mind; for he is not a mortal, that he should change his mind” except that God appears to change God’s mind quite a few times throughout Scripture, including, oh, just now? God wanted Saul to be king, but then was sorry. That sounds suspiciously like changing your mind. Okay, end of post-script!